Officials say that S.A. Kursting and Frank O’Keefe immediately confessed to petty crimes and said they believed the men were trying to avoid more serious charges. Police say a copycat holdup of the Bimini Baths car was staged by the men’s friends to divert suspicion. Despite the arrests, further holdups continued in San Bernardino and officials of the Los Angeles Railway are considering whether to formally issue firearms to conductors and motormen, some of whom are already carrying guns. A special squad is sweeping through the Los Angeles River bed and railroad yards, arresting hobos and vagrants. In the meantime, city officials are wondering what to do with men who have been arrested since the jail is full. One suggestion is to build a stockade in the riverbed. The Times notes that many of the men are being herded together and sent out of town. I wonder if this is an instance of the old practice of “floating,” in which police dropped off criminals or other undesirables at the county line. 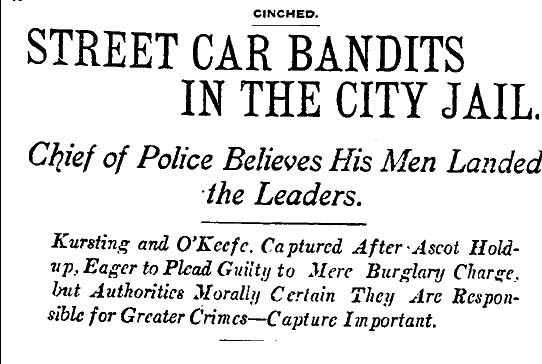 After reporting the initial arrests, The Times has no further word about Kursting or O’Keefe.